Seafaring Scotsman Jack Kent has enjoyed his share of trysts with bored society wives, but pleasure--not love--has always been his aim. Until the day he finds his carriage--and his life--invaded by a disheveled American heiress. Even rumpled and torn, nothing can hide Amelia Belford’s enchanting beauty or her fiery will to be free. And for the first time Jack is faced with a woman who arouses in him something more than desire. Amelia never dreamed her desperate flight from an arranged marriage would find her scrambling out of a church window, landing in a tangle of twigs, and finally darting into the carriage of a stranger. And she never imagined she’d then set sail for his ancestral home--and discover passion in his arms. But Amelia is not the only one with a scandal to her credit. She soon senses pain behind Jack’s caresses--secrets he will not reveal. Just as she breaks through his reserve, a devastating scheme forces them apart. Could the same adventurous spirit that brought them together also be their undoing? Only the truth--and one more impetuous act of courage--will tell. Karyn Monk has been writing since she was a little girl. While attending university, she discoverd a love for history. After several years working in the highly charged world of advertising, she turned to writing historical romance. She is married with two children. "Lovely description and gentle humor characterize Karyn Monk's writing as she tells this sweet gem of a story. . .Admirable strength of character, inherent integrity and very human flaws make Jack and Amelia endearing. 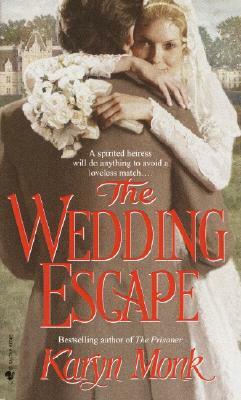 The Wedding Escape is a story readers will enjoy and long remember!"